Many organic chemical reactions take very long to complete, and in order to speed up these reactions, heat is applied. Organic compounds are often volatile with high vapour pressures and low boiling points. When heated to a certain extent, they will become flammable and result in explosions. Thus, the application of heat must be done in a specific way to overcome the issue of evaporating too much solvent and drying the reaction vessel. Reflux involves heating the chemical reaction for a specific amount of time, while continually cooling the vapour produced back into liquid form, using a condenser. The vapours produced above the reaction continually undergo condensation, returning to the flask as a condensate. This way, it guarantees that the temperature of the reaction remains constant. The reactants for reflux experiments can be solid and liquid, or both liquids. The temperature at which the reaction is heated depends on the boiling points of the solvents and also the reflux ring (see below). The condenser is always completely filled with water to ensure efficient cooling. The vapours, which are given off from the liquid reaction mixture, change from gas phase back to liquid phase due to heat loss. This then causes the liquid mixture to fall back into the round bottom flask. During the reaction, a part of the solvent travels up the condenser tube before condensing back into the flask. Above this point, the inner jacket of the condenser will appear dry. Below this point, the solvent flows back into the flask. The boundary between these two portions is the reflux ring. The temperature of the reaction must be set so that the reflux ring should only be one-third to half way up the condenser. To know that boiling point has been reached, bubbles of vapour are produced inside the liquid. 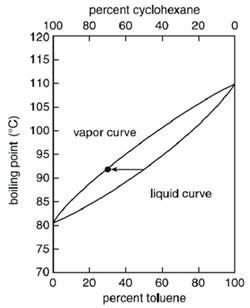 If the heating rate is turned up, the temperature of the reactants does not change, but the rate at which the boiling liquid changes into vapour form increases. This increase is caused by the increased supply of energy that facilitates more liquid molecules into overcoming their intermolecular interactions to enter the gas phase. When a mixture of two or more volatile compounds is heated, the total vapour pressure (PT) of the mixture equals the sum of the vapour pressures of compound 1 and 2 (P1 and P2) in the mixture. The magnitude of the vapour pressure exerted by each compound is determined by the vapour pressure of that compound (P0) and the mole fractions of both compounds 1 and 2 present in the mixture (X1 and X2). Depending on the mixture, the temperature boils variably. Homogenous mixtures boil at a temperature between the boiling points of the pure compounds, but the exact value depends on the amount (mass or volume) of each compounds. For example, a liquid mixture when boiled will yield a vapour that will contain a larger percent of the more volatile compound. In a mixture of cyclohexane and toluene, cyclohexane is more volatile between the two and a liquid composed of 50 percent cyclohexane and 50 percent toluene would boil at 90°C and yield a vapour composed of 70 percent cyclohexane and 30 percent toluene. When it comes to separating compounds a common method that is used in organic chemistry is distillation which separates compounds based on differences in boiling points. 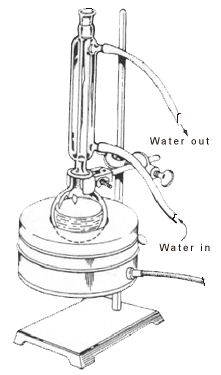 In more sophisticated experiments, reflux and distillation can be carried out at the same time. 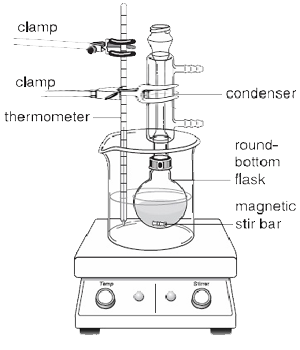 For example, while a reaction is refluxing, a microscale distillation can be carried out using specialized equipment. Microscale distillation is to shorten the distillation path to reduce the chance for material loss in the process. Sidenote: The vapours of the heated liquid rise upward and cool to condense on either the inside walls of the Hickman head or on the walls of the condenser. The liquid that drains downward collects in the circular well at the bottom of the still. 1. 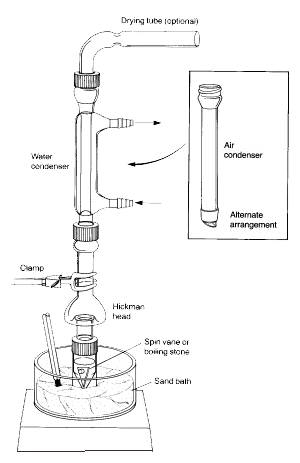 The conical vial should be securely attached to the Hickman distillation head and the air condenser using the compression cap and the metal clamp. All pieces should have a ground-glass joint and fit together well such that no major leaks occur. 2. The spin vane should be placed in the conical vial and be pointed downward. The flat septum and the small compression cap are used to close the side port of the Hickman head. The entire setup is placed in the appropriate hole in the Al-block or sand bath and centered on the hotplate before starting to stir (otherwise the spin vane will flip over and rotate improperly). 3. The Hickman head and the air condenser have to be cooled with a wet paper towel. The heat source should be set so that the compound of interest distils over slowly. In the above set up, the Hickman Distillation Head acts as both an air condenser and a condensate collection vessel for simple or fractional distillations. The Hickman head can be separated into two types: ported and unported. It is easier to collect fractions with the ported Hickman head. To do so the port should be opened to remove the liquid in the well with a Pasteur pipet (see 'C' in Figure 3). 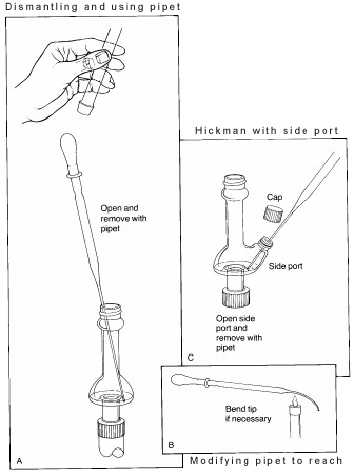 For the unported Hickman head, the Pasteur pipet is used to draw the liquid out from the top. (see ‘A’). If a condenser or internal thermometer is used, the distilling apparatus must be partially disassembled in order to do this. In some stills the inner diameter of the head is so small that it is difficult to reach in at an angle with the pipet and make contact with the liquid. To solve this issue, the tip of the pipet should be bent slightly in a flame. Once removed, the liquid is transferred to a small vial and capped with a Teflon-sealed cap. If there is more than one volatile compound in the vial, it will be necessary to start with low heat to distill the lower boiling compound first. This way, compounds with a difference of boiling point of at least 50 oC can be separated relatively cleanly. 1. 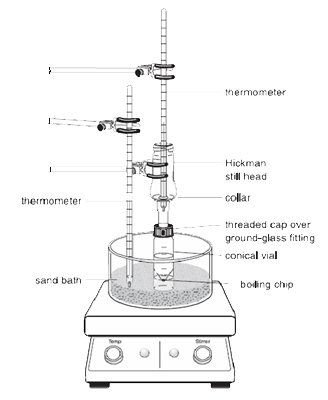 The conical vial should not be more than half filled in order to leave enough room for the liquid to boil. Otherwise the solution will spill out or over when it starts to boil. 2. A good seal between the joints minimizes the loss of target compound during the distillation. It also prevents dripping of a compound onto the hotplate, and a possible fire accident. 3. An appropriate temperature setting has to be used. Often times, a water or oil bath is used for better temperature control. If a heating mantle is used as heat source, it has to be plugged into a variable power control.